Ten years prior, the prophet Elijah came by to interrupt the life of a young man plowing a field. From behind a plow God called a prophet. Elisha responded by inviting everyone to feast on his team of oxen. No matter what happened with the prophet gig, there was no going back. For the next decade and the next 4 chapters of Scripture Elisha’s name isn’t mentioned. His story is absorbed into Elijah’s. Elijah’s story has become Elisha’s life. Elisha mourned the prophet’s departure as if it were the loss of his father. In a sense, the loss of a father is exactly what it was. Some give us natural birth. Some show us the way to new birth. But what does Elisha mean as he mourns for the horsemen? The phrase, “The chariots of Israel and its horsemen” refers to the strength Elijah brought to the nation. No doubt Elijah had been strong in Elisha’s life. Elijah’s departure not only left a gaping hole in Elisha’s soul; his absence potentially left a gaping hole in an already crumbling nation. As the chosen successor, Elisha no doubt felt the weight of responsibility crash onto his shoulders. It is the feeling you get when the person who has explained everything to you is no longer there to explain anything to you. In times of distress our heart seems to become keenly attracted to doubt. What if Elisha was not for Israel what Elijah had been for them? Elisha rips his clothes. Physically he demonstrates what is emotionally happening to him. He is shredded by the absence of the man who formed him. Across the river stands a company of 50 prophets (2 Kings 2:7); no doubt watching to see what will happen next. On paper, Elisha has been tapped the next prophet, but can he handle it? The dream is exciting. Reality is risky. Elisha gathers himself and then finds Elijah’s cloak laying off somewhere to the side. The cloak was important because only a few moments prior, Elijah and Elisha had separated themselves from the 50 spectator prophets when Elijah rolled up his cloak and struck the Jordan River parting the waters so the two of them could cross on dry ground (2 Kings 2:8). Now Elisha holds the cloak. What will Elisha do? He does what every man endeavors to do – pick up where the most important man in his life left off. There is a lesson for all of us in this. If others do what you did last, what will they do next? At the moment Elisha asked the question, there was nothing the man could do to answer it. If God did not answer, Elisha ran the risk of raising up from the water nothing but a dripping wet cloak. How much of what we do doesn’t require the power of God at all? How much of what we ask of God are questions we can answer for ourselves? How much of what we do is to save face, to make sure that we are not disappointed by wet cloaks? How much of what we do is designed to keep the cloak dry? We were not called to avoid potential disappointment. We were called to be desperate. The world will not listen to our message of saving faith if all they see of us is safe faith. Jesus decreed that the gates of Hell would not prevail against us, but according to Muriu, our caution will be our demise. We have never been called to save face before spectators. We have been called to demonstrate to a watching world the power of the resurrected Christ in and through His people. 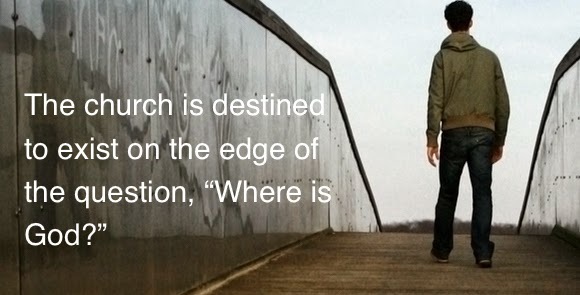 He has purposefully placed us on the razor’s edge of a vision we cannot afford or fulfill on our own. We are not to be irresponsible fools in Jesus’ name, but if the words “This will never work” are seldom heard within our churches, we are fools to believe we are obeying God’s call. And the water parts. Inexplicable. Undeniable. We need to run the risk of requiring head scratching acts of God that make one thing abundantly clear – if He doesn’t answer – we have no God. We need something to happen in our churches where it is treason against Heaven if the pastor is applauded. We need the worship leaders and musicians to be forgotten in the amazement of what God has done. We need a move of God for which there is no order of service. The lost world is watching and knows that most of what we are doing can be easily reproduced, and with much higher quality I might add, in a night club, or a comedy show, or a motivational talk. We are not entertainers – we are sheep for the slaughter. We die daily. They need us to be in the place that requires an answer to the question, Where is God? God has destined the church to be the stewards of that miraculous place. Take the cloak. Ask the question. Strike the water. Posted in Church, Devos for the Elisha Series, Devotion, Mission Life, Studying Elisha, Understanding the Bible.